Sajadzadeh, Hassan, Lotfi, Afsaneh, Shahbazi, Mehrdad. (1396). Evaluating the Quality of Life Dimensions in Marginal Urban Communities to Take Advantage of Development Stimulus Projects, Case Study: Dizaj Town of Hamedan. معماری و شهرسازی آرمان شهر, 10(18), 121-131. Hassan Sajadzadeh; Afsaneh Lotfi; Mehrdad Shahbazi. "Evaluating the Quality of Life Dimensions in Marginal Urban Communities to Take Advantage of Development Stimulus Projects, Case Study: Dizaj Town of Hamedan". معماری و شهرسازی آرمان شهر, 10, 18, 1396, 121-131. Sajadzadeh, Hassan, Lotfi, Afsaneh, Shahbazi, Mehrdad. (1396). 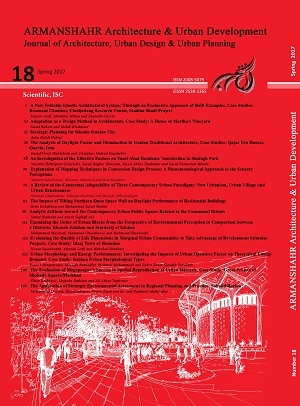 'Evaluating the Quality of Life Dimensions in Marginal Urban Communities to Take Advantage of Development Stimulus Projects, Case Study: Dizaj Town of Hamedan', معماری و شهرسازی آرمان شهر, 10(18), pp. 121-131. Sajadzadeh, Hassan, Lotfi, Afsaneh, Shahbazi, Mehrdad. Evaluating the Quality of Life Dimensions in Marginal Urban Communities to Take Advantage of Development Stimulus Projects, Case Study: Dizaj Town of Hamedan. معماری و شهرسازی آرمان شهر, 1396; 10(18): 121-131. 1Assistant Professor of Architecture, Faculty of Art and Architecture, Bu-Ali-Sina University, Hamedan, Iran. 2Master of Urban Design, Faculty of Art and Architecture, Art University of Isfahan, Isfahan, Iran. 3Ph.D. Researcher in Architecture, School of Engineering, Islamic Azad University Borujerd Branch, Borujerd, Iran.